Eugene Morrow Violette, the eldest son of Thomas Henry & Julia (Horn) Violette, was born September 4, 1875 on his Grandfather Violette’s farm near Pittsfield, MO. He died March 26, 1940, at his home in Baton Rouge, LA. Eugene grew up in Clinton, MO, where he worked in his father’s shoe store while attending Clinton High School and Clinton Academy. In 1892, while a student at the Academy, he joined a group of friends (“the gang” in his diaries) to become one of the six founding members of Phi Lambda Epsilon fraternity. 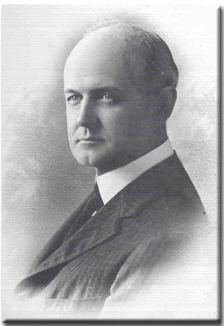 In 1895, he entered Central College (now Central Methodist University, Fayette, MO, and three years later was awarded a Bachelor of Arts degree. He then moved on to the University of Chicago for an MA in History the following year. After teaching several years, he twice took sabbaticals to work on his PhD at Harvard; he completed the course work but was unable to finish the degree program. Violette began his long teaching career as an Assistant in History during his senior year at Central. Upon completion of his Master’s, he was appointed Acting Associate Professor of History at the University of Missouri for one year, then accepted a permanent position as Professor of European History and Head of the Department of History and Government at the First District Normal School (now Truman State University) in Kirksville. Except for a year’s leave to teach at Washington University, St Louis, 1920-21, he remained in Kirksville from 1900 until 1923 when he went to Louisiana State University as Associate Professor of History. He was Professor of English History there at the time of his death in 1940. Although Violette’s professed areas of interest and training were British and medieval European history, he became one of Missouri’s premiere state historians. His extensive works on Missouri history include A History of Missouri (1918), the standard public school textbook for many years. While in Kirksville, he created the Normal School archives and began collecting artifacts for what would eventually become the campus historical museum, later named the EM Violette Museum in his honor. Off campus, he initiated the drive for an Adair County Historical Society, was a founding Trustee of the State Historical Society of Missouri, served on the Mississippi Valley Historical Association’s editorial board, was on the Missouri Centennial Commission, and was a very active member of the American Historical Association, the Missouri Teachers’ Association and numerous other professional organizations. In 1902, Eugene married Miss Hallie Hall (1870-1935), the daughter of George and Rachel Abbott (Smith) Hall of Trenton, MO, and an English instructor at the Normal School. The couple had two children, Homer Newton (1903-1982), and Rachel Eugenia (1905-1992). His second wife was long-time family friend and Kirksville school teacher, Mrs Elizabeth “Bessie” (Smith) Starr (1886-1938). She died during their honeymoon voyage to Europe, only two months after their Christmas 1937 wedding. When Eugene Violette died in March 1940, his children donated his personal library and papers to the two schools where he had spent the major portion of his career, Northeast Missouri State Teachers College (the old “Normal School”) and Louisiana State University. The LSU library was to select the documents and books related to Louisiana that they wanted for their collection and the rest, including personal diaries and scrapbooks, were to come to Pickler Memorial Library at Northeast. EMV’s extensive library of rare and out-of-print books on Missouri government and history forms the core of the Violette-McClure Missouriana Library (identified as “MO Collection” on the library catalogue). His papers, approximately 8 linear feet plus 18 volumes, include numerous draft versions of his books and articles, professional papers primarily from his years in Kirksville, 1900-23, and personal and family papers which are all inclusive of his life. Researchers using these materials might also be interested in the Eugene M Violette Collection at LSU. ◙ Form letters re pledge payments, Mulanix Street Methodist Church (MECS) (2); ◙ Missouri Anti-Saloon League ▪ re membership, 1918; ▪ “continue the fight" form letters (2), nd; ◙ Invitation to US Vice President Thomas R Marshall to stay with Violettes while opening Democratic campaign in Missouri, 1918; ◙ National Committee for the Prevention of Blindness, membership solicitation; ◙ State YMCA membership renewal letter; ◙ County Committee to raise funds for YMCA work at US Army camps, 1917; ◙ Letter from Henry Ford’s secretary transmitting 6 copies of Ford’s booklet The Case Against the Little White Slaver (anti-smoking literature); ◙ Missouri Centennial, 1921 ▪ Missouri Pageant of Progress, Director’s Script ▪ St Louis Missouri Centennial Association, Publicity Committee Bulletin No 2 ▪ McClure, CH “The Missouri Centennial”, removed from The School and Community (ca1920) ; ◙ Federation of Missouri Commercial Clubs, resolutions & reports of June 1919 annual meeting. This book was originally planned as an enlarged & updated revision of Select Documents of English Constitutional History by George Burton Adams & H Morse Stephens (Macmillan, 1901), but when permission to revise was withdrawn by an author’s heir, it was issued as a supplement, beginning where the earlier book had left off.